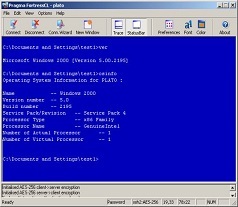 Pragma Fortress SSH Client Suite is a comprehensive collection of Windows client-side programs that give you secure access to files and data on remote computers. Pragma Fortress SSH Client Suite includes a variety of high-value programs and management tools to improve your productivity and simplify your remote access transactions. Pragma Fortress SSH Client Suite combines all of these capabilities into a single, full-featured package. It is easy to install and use, and flexible to accommodate whatever protocol you need.